Hydra is a small island in the Saronic Islands in the Aegean Sea. Free of cars, the locals go everywhere on horseback or by boat. The entire island is a preserved national monument. Hydra is an island of sumptuous mansions and humble abodes sitting side by side. It is utterly unique and is only 45 miles from Athens so relatively easy to get to. Once on the island it’s easy to see why people love it. It is like stepping back in time. At the main port, donkeys with carnations tucked behind their ears and human-pulled trolleys wait to haul luggage and supplies up the winding cobblestone streets. There is only one type of motorised four wheel vehicle on the island and that is the rubbish truck (there are five on the island and they only appear in the small hours). There are no cars or motorcycles so horses, mules, donkeys and water taxis provide public transport. Hydra has inspired poets, writers and artists across the years. The port is very buzzy and lively especially at night when all the bars and tavernas come to life. The island is 23 km long and only 5km at its widest point. There is masses of swimming off the coast - at beaches, from swimming rocks and also from swimming platforms. The water is bright blue turquoise and so clean. Beaches have great tavernas, some with sunbeds and others so remote you have to get to them by boat. There are lots of boats which leave the port and drop passengers on beaches all day long - or you can rent your own boat and be captain for the day. Fresh fish and grilled meats accompanied by Greek Salad can be found all over Hydra. Other typical dishes include Keftedes (small meatballs with oregano and mint), Melitzanosalata (aubergine dip), Yiovetsi (lamb or veal baked with orzo and tomatoes) and Spanakopita (spinach and feta cheese pie). There is a good choice of traditional souvlaki and amazing seafood including Kalamari, Herring, Anchovies and Red Mullet. The wine and cocktails are imported but there is a good choice. The island is well known for wonderful coastal walks, there are many chapels and monasteries to visit and a good choice of beach. Boating is a must, it is possible to hire boats on the island to visit the smaller, more deserted beaches. Take mule rides to any one of the glorious hilltops. Eat out and enjoy the amazing views. If you’re into art you’ve come to the right place, Hydra has become a mecca for art dealers and buyers. Almost all the nighttime action is in Hydra Town along the quay or in lanes just inland. The Pirate Bar in the port is a MUST, a landmark place to visit. There is delicious food and dancing at night. Great cocktails and dancing til dawn. There is dancing and cocktails at a good selection of different bars so you certainly won’t be bored after dark! 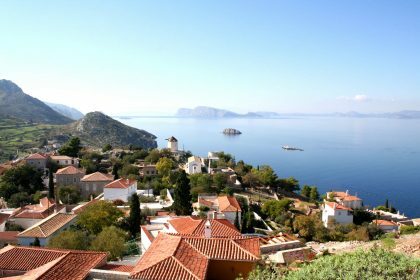 Sightseeing in Hydra is a joy, visit any one of the beautiful sights nearby by boat. Nip to neighbouring islands such as Spetses for the day to experience culture of a different sort. There are some cute shops too - lovely boutiques selling jewellery, clothes and sandals. Walking, eating and boating. The island is also well known for its good choice of art galleries, there are wealthy villa owners all over the island (and not many are rented out) and many serious art collectors have holiday homes here. This has resulted in a great spate of art dealers having a base in Hydra. The island has been an attraction to so many celebrities over the years, from Onassis and Jackie Kennedy, Sophia Loren and Leonard Cohen to Hemingway and Henry Miller. It has long been an attraction for the rich and famous.